Homes are selling again in Weems Plantation, a popular Northeast Tallahassee neighborhood that has seen some tough times of late due to the relatively young age of the community. As we have discussed in the past, neighborhoods that were created after 2000 sold like fire during the boom of the housing market, but they now face a near-mass exodus as normal demographic trends have created a backlog of people who would normally be making their next move. In an established neighborhood (for example, Killearn Estates), the impact is not nearly as great as for those where everybody moved-in during the past ten years. With home sales happening at the slowest rate in over 20 years, it is nice to report that homes for sale in Weems Plantation are starting to sell. 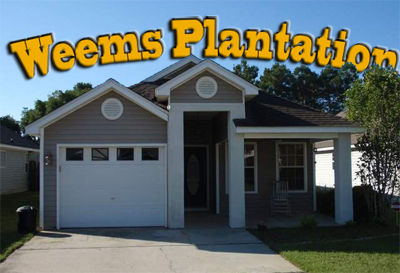 Through April 2012, Weems Plantation has recorded 8 home sales. 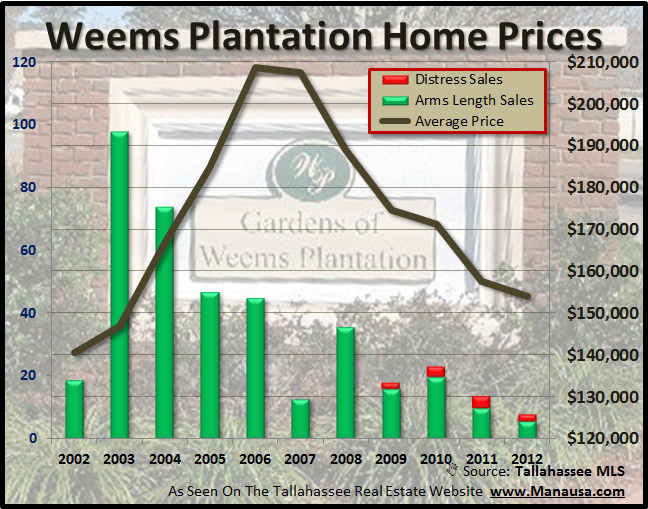 Considering 2011 only saw 14 sales, it is safe to say that 2012 looks to be far brighter for people who need to sell a home in Weems Plantation. The average sales price of a home in Weems Plantation in 2011 was $157,800, which was down from the $209,000 average in 2006. The graph below shows no signs of the decline stopping anytime soon, in fact the average thus far in 2012 is $154,150. The percentage of recent sales that have been distressed properties is on the rise, which will make it even harder for arms length home sellers to hold out for more money in 2012. 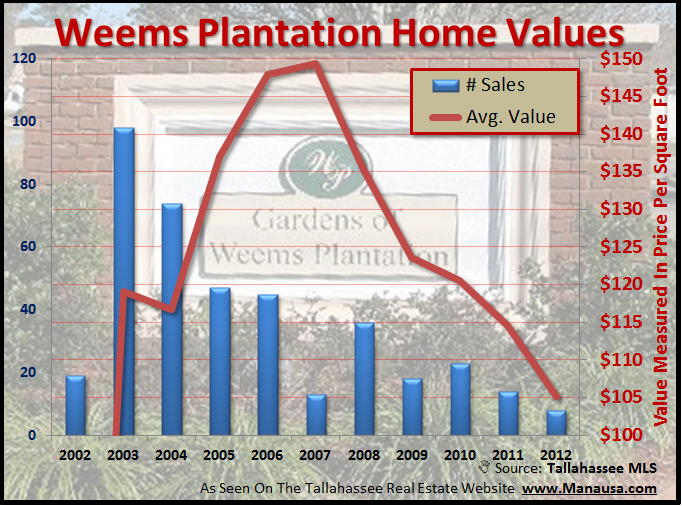 Home values have fallen 30% in Weems Plantation, from nearly $150 per square foot in 2007 to an average of $105 per square foot thus far in 2012. With more short sales and foreclosures hitting the market, we can expect to see further real estate depreciation in Weems Plantation. While this report has plenty of negative news with home values still falling, it should be seen for the positive growth in unit sales. We cannot work through our supply and demand imbalance until homes are sold, so this is a good sign.